Front row, left to right: Helen Ross, Eleanor Macintosh, Shirley MacPherson, Andree Fraser, Fiona Urquhart, Leslie Edmeades, Christine MacKay. As it is the 50th anniversary of this picture, would anyone like to have a get-together? If so please contact me on e-mail address below. 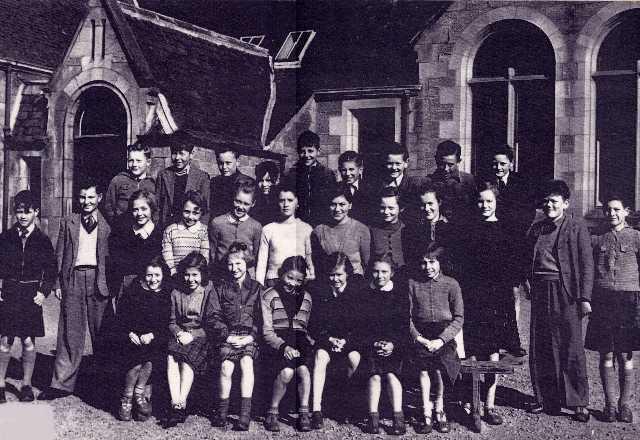 Boy second left in back row looks very like Paul Kennedy who used to stay in the "Bonemill Houses" in the High Street...his father Willie drove one of the Lorries at the Bonemill. Paul emigrated to Australia in the early sixties (not sure of date). Masher Kennedy was older than this class. I worked with him for Ack Davidson when we both should have been in school, but pocket money was not so easy to get in them days. Does anyone know what happened to Helen Ross? I know that she joined the WRAF. I would like to get in touch with Helen Ross as I have in my possession a small artefact of hers from Invergordon Academy. For nostalgia she may want it?